← Market Timing Brief for the 7-17-2015 Close: It’s the Same This Time. Small Caps Hesitate with Large Caps On the Line. Gold Breaks. Rates Fall. 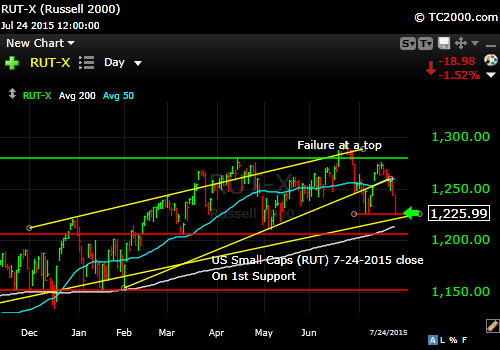 Market Timing Brief for the 7-24-2015 Close: Stocks Reach First Support. Gold Has A Good Day After a Bad Break. Rates Fall. 1. The Current SP500 Index Chart (SPX, SPX; click to enlarge): The market fell and on Friday stopped where I said it would. It doesn’t always work out quite so well, but we diligently look for hints for when the market is topping vs. when it’s bottoming, so we can buy and sell appropriately. They key is: “Buy lower, sell higher.” Sounds simple? Well, most investors buy high on greed and sell low in a panic. Who knows whether we are at the ultimate low in this swing lower? No one. But my belief is that we are notably still in a pause, and not in a long term Bear market, that is, until and unless more damage is done. We want to be buyers lower and sellers higher until the overall game changes from Bull to Bear. We also want to keep our exposure up fairly high until that game changes. Some of you will trade the swings more aggressively and if it works, good, but in a Bull market, there’s a risk of being left behind too. If you sell everything right here for example, what do you do if the market rallies back to the prior high? Do you and will you buy it all back? Most individual investors won’t, and delay their buying, feeling they were right and then under-perform the market. And you may decide to use market timing simply to add old or new cash at smarter spots in the inevitable market swings. There are a few stocks that are having outsized reactions to earnings, such as Google and more recently, Amazon, but the fact that the market is falling at the same time is of great concern. Bad breadth it is called. Investors cling to fewer and fewer stocks near tops. 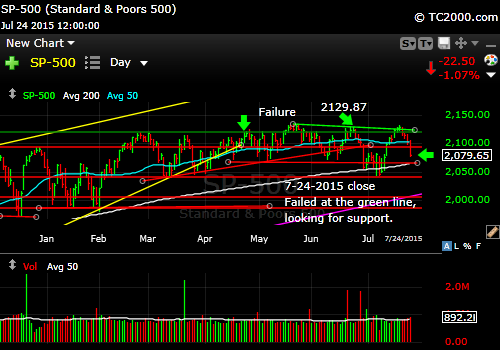 SP500 Index falls from a key resistance line and is searching for support. Where are we now? The SP500 would appear to have farther to slip, but there is a support line shown in yellow in the chart below, which could provide a bounce, at least temporarily. 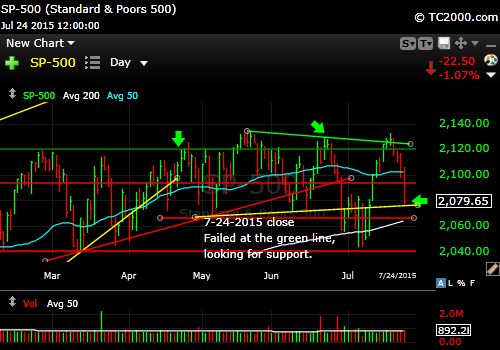 2068 and 2044 are the next levels of support. Be willing and able to add at lower levels if you can. (You can check my current exposure level including US/Non-US percentages on Twitter®/StockTwits®.) Remember that what I do, is what I do, and you need to determine your own plan, one that fits you. I do believe the Federal Reserve will navigate us out of the current spot, but the sooner they indicate their hand is off the rate raising button, the better, and the better the market will respond. Is that “right”? Not at all. Quantitative easing represents one of the greatest market manipulating feats that has EVER been attempted by the sheer numerical value of QE. 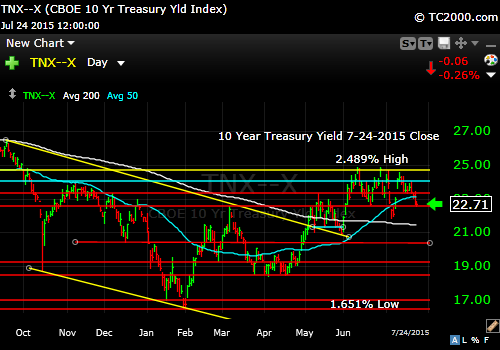 Note the yellow support line (see text). 2. I said last week that small caps not participating in the prior rally was an issue for the overall market. It is a sign that market participants are starting to doubt less liquid stocks, because the big players cannot get out of them when liquidity dries up. You can see that there is room to fall one more notch at least before this pullback ends, but there is no guarantee. Failed to make a new high. 3. Gold has been falling like a rock, golden or otherwise. 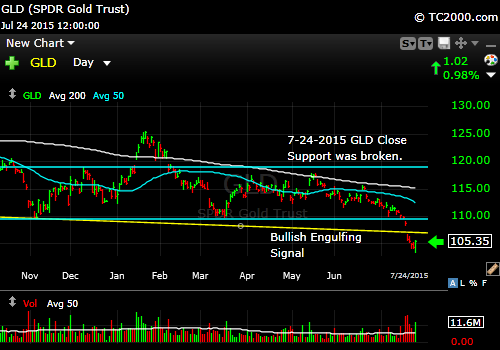 You can see the major support that was just violated. At times, a market will bounce back to such a line and then lose momentum, again falling to new lows. The fuel for a bounce? On Friday, GLD finally had what is called a Bullish engulfing day, with a lower low and a higher high than the prior day, followed by a close at a new high. Gold finally has a technically positive day. 4. Bond and Treasury yields are falling again. You see below that we’ve reached a first support level, so it is theoretically possible that the current price will hold, but there is also plenty of room below. The Fed is going to have to wait to raise rates much longer than is currently expected by market participants. I believe that is starting to dawn on them, but opinions change gradually. If the Fed raises rates too soon, which certainly would be any time before the end of the year if not much longer, the U.S. dollar will skyrocket, and U.S. business profits will decline further at a time when the dollar has already rallied and the worldwide economy has already slowed. The stock market would react negatively to that development. What we want to see then, is rates staying confined in the range shown on the chart, preferably falling further from here. Yields are falling again, which means assets are going back into U.S. Treasuries. This entry was posted in Bonds, gold, investment, large cap stocks, S&P 500 Index, small cap stocks, Treasuries and tagged 10 year treasury, bullish engulfing day, federal reserve, gld, gold etf, IMF, iwm, market timing, quantitative easing, rut, sp500 index, spx, spy, tbf, tlt, tnx, tyx. Bookmark the permalink.